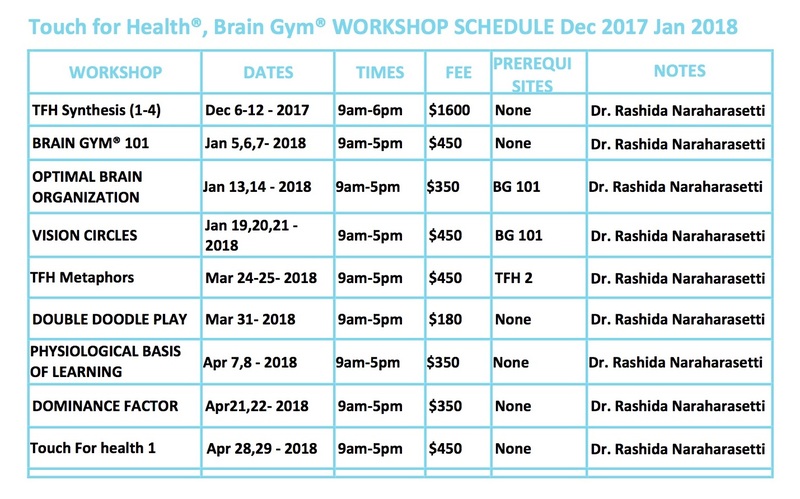 Here is a schedule of our Workshop Dates for Touch for Health® and BrainGym® in 2017-2018. Below is a list of the classes and workshops that we can provide as well as some testimonials from workshop organizers and attendees. “While on the journey of positive health the friend that introduced me to Dr. Rashida invited her as a guest speaker to one of our conferences. Both of us were a bit concerned of the number of people that were even interested in attending Dr. Rashida’s presentation. Well, we looked at the conference hall and there was standing room only. Dr. Rashida’s presentation captivated even the most skeptical people in attendance. She described in detail how to address health and wellness issues that could be corrected in a matter of minutes. As a result of the presentation, a number of participants sought the guidance of Dr. Rashida.